Ouzel Falls spills over a cliffside and enormous boulders, making it arguably one of the most beautiful waterfalls in Rocky Mountain National Park. Before reaching this 40-foot falls, the trail traces the course of several creeks and leads hikers past three other cascade waterfalls. 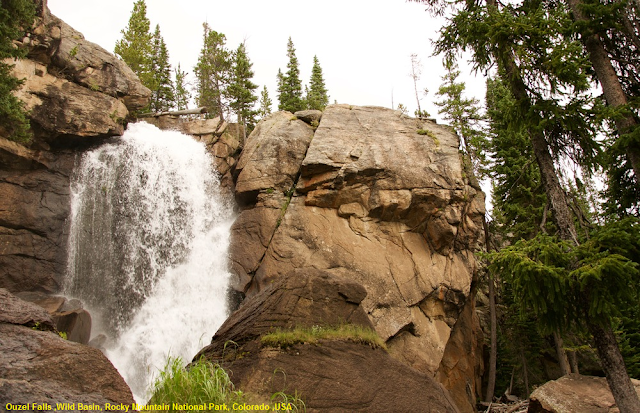 The hike to Ouzel Falls begins from the fairly remote Wild Basin Trailhead in the southeastern corner of Rocky Mountain National Park, located near the small communities of Meeker Park and Allenspark. To reach the trailhead from Estes Park, drive 12.6 miles south on Colorado Highway 7 to the Wild Basin Road junction and turn right. After driving 0.4 miles make another right turn into the park. The Wild Basin Trailhead is located roughly 2.2 miles from the park turn-off on a narrow, two-wheel drive gravel road. This hike offers several attractions along the way, including Copeland Falls and Calypso Cascades. Lower Copeland Falls, your first destination along this route, arrives at just over three-tenths of a mile from the trailhead. The upper falls are located roughly one-tenth of a mile further upstream along the North St. Vrain Creek. There's a side trail that visits both the lower and upper falls. This trail parallels the main trail, and once you've visited Upper Copeland Falls, will allow you to return back to the main trail without having to backtrack.